Enclosed within its rugged mud brick walls the temple precincts at Dendera seem to be an island left untouched by time. Particularly in the early hours of the morning, when foxes roam around the ruins of the birth house or venture down the steep stairs leading to the Sacred Lake. Stepping into the actual temple is like entering an ancient time machine, especially if you look up to the recently cleaned astronomical ceiling. This is a vast cosmos filled with stars, hour-goddesses and zodiac signs, many of which are personified by weird creatures like snakes walking on long legs and birds with human arms and jackal heads. On the columns just below the ceiling you encounter the mysterious gaze of the patron deity of the temple: Hathor. Deeper into the building (which dates from around 0 AD) is the crypt with the famous "light-bulb" reliefs where the golden statue of Hathor's soul was kept. From there you can follow the route of a New Year procession to the roof of the temple where Hathor's golden soul was rejuvenated by the rays of the sun on the first day of the Egyptian year. 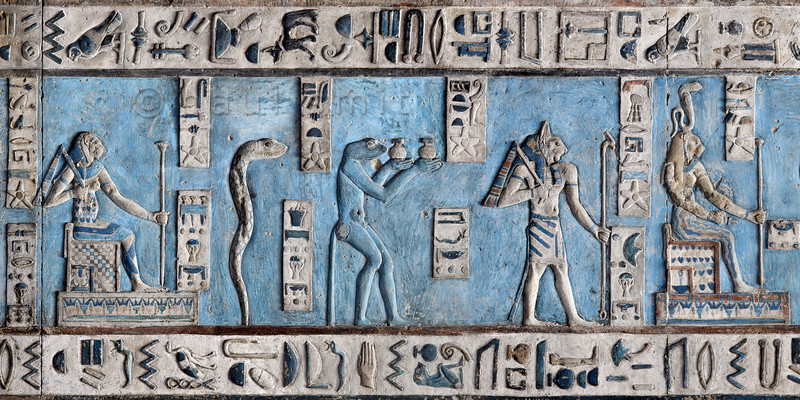 Snakes and lions in all kind of forms populate the astronomical ceiling in the outer hypostyle hall of the Hathor Temple at Dendera. The ceiling consists of seven separate strips but here we are looking at a detail of the upper register of the SECOND STRIP WEST from centre. The figures in this picture represent decans. Decans were essentially 36 stars or star groups near the ecliptic whose rise or transit could be used to tell the time during the night. Eventually they were also used by astronomers as place-markers in the sky to divide up the Ecliptic in equal portions. Decans first appear during the Middle Kingdom on the inside of coffin lids, providing the deceased with his own private start clock. Unfortunately, during the subsequent centuries many different lists of decanal stars were developed and very few of these stars can be identified on a modern star map. The decans in this register were listed by Neugebauer and Parker as belonging to the Seti I B decan family. A peculiarity of these decans is that each is associated with a certain mineral, metal or type of wood. It is mentioned in a little caption near the lower part of each figure. Thus the lion-headed seated goddess on the left represents decan number 10 and is paired off with glass and gold. The erect snake next to her is decan no. 9 and is associated with iron and gold. The snake-headed baboon, no.8, is coupled with turquoise. The cat-headed god, no. 7a, is watching over copper and gold. And the lion-headed seated goddess, no. 7 is associated with gold. For other decanal stars in this register see picture 29572 and 29573. This part of the Dendera Temple was built during the Roman period (first century AD). Photo Paul Smit.